Samsung has been apprehensive regarding firmware update of the older sets of the Galaxy series but it has finally provided updates for those sets. 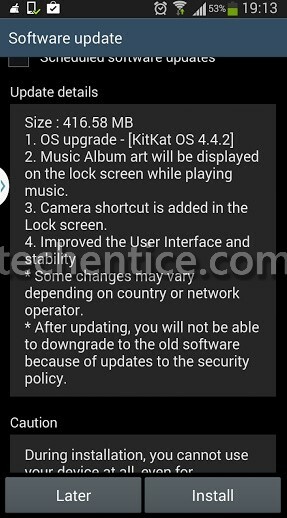 The top one in the list is Galaxy Note II GT N7100 and the good news is that the update is available. Firmware update is completed for Galaxy Note II LTE, Galaxy S4 mini LTE, Galaxy Note III and other devices which are under testing phase are Galaxy S3, S3 LTE, Galaxy Grand 2, Galaxy Mega 5.8 and Galaxy Mega 6.3. 1. Music album art will be displayed on the lockscreen while playing music. 2. Camera shortcut is added in the lock screen. 3. Improvements in user interface and stability. 4. Some basic features have been modified like GPS has been replaced by Location, full screen album art, transparent status bar, wireless printing functionality, NFC tap-to-pay support, option to set default messaging and launcher apps and many more. All features will not be available to everyone. It depends on the network operator or the country. One more thing, you can’t degrade down to previous versions of Android.